No, not the David Bowie song just time to take stock and post a quick piece of IRL content. When I started this blog little over a month ago it was on a whim and I wasn't sure I would stick it out, I've tried in the past and never got past registering the names! My hope was to get about 50-100 views by now, in fact there have been over 600 page views by you lovely, lovely people. As this is something that I am planning now to stick with there are a few changes I want to make. The blog will stay as it is, with the exception of some small changes you may have seen. A member of a community I am in on discord very kindly did some work on my logo and a new banner is in place. Along with this we also now have a Parcival Plays Favicon rather than a Blogger generic one, and we've got rid of the orange highlights on the page and moved to a blue (which is actually one of the blues already in the logo). It's also time to diversify a bit and you might notice some changes to the contact section in the right side bar. Now in addition to Twitter and Email you can join my Steam Group which I have set up so that I can start posting my content as Steam Curator recommendations, but also as a route of communication with my readers. Also for a way to chat with you and find out what you are playing or even what games you want me to try and get a look at, I have set up a Discord you can join from the widget to the right. Finally, I've taken a tentative step and dipping my toes into the world of YouTube. I plan to post the occasional Let's Play video of some of the games that I've covered, or ones that I feel would be easier to show rather than write a full article. 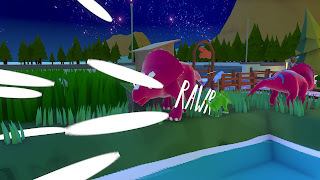 I've already posted a couple of videos of Parkasaurus and hope that as I make more videos they will only get better (I know these ones have a few issues). For now I've not got anything else I need to say other than thanks for your ongoing support and don't hesitate to fire me a message. 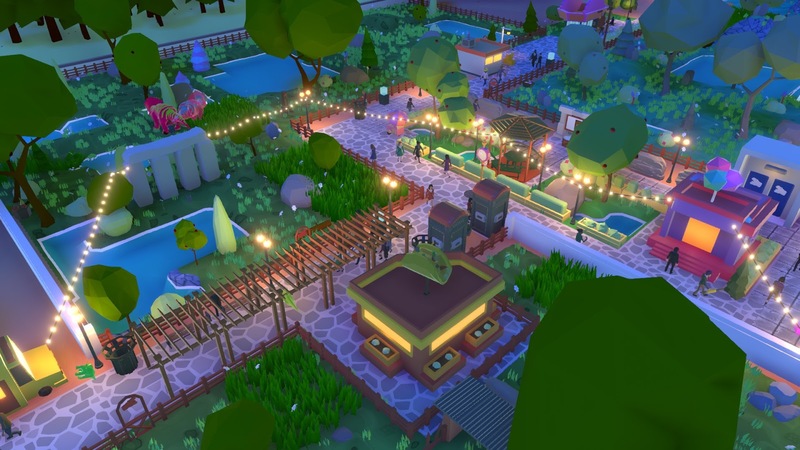 A few weeks ago we had a quick preview look at cute dino park builder Parkasaurus from Canadian 2-man team Washbear Studios. I've been waiting, impatiently, for this since I first saw the announcement trailer back in November and can say the wait has definitely been worth it. 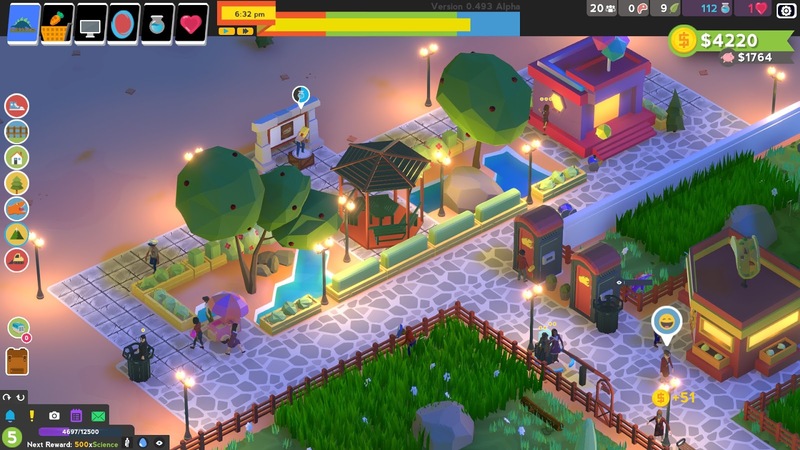 The game had originally been slated to hit Early Access back in Spring but the team took the hard decision to push the release back until they felt it was in a better state. 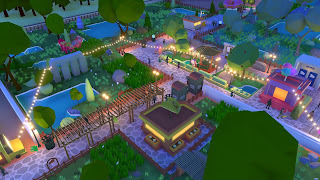 This has given them time to add some new dinos, new guests following feedback from the announcement trailer and fix some of their bigger bugs (they had one where any water would cause your park to flood). I'm going to try not to repeat too much from the other article and look a bit more at how the game actually plays out. Being Early Access though, some of this will be subject to change depending on feedback from players, and more features still need to be added as development progresses. In the final game there will be 3 game modes (normal, custom and scenarios) with the first two already implemented. 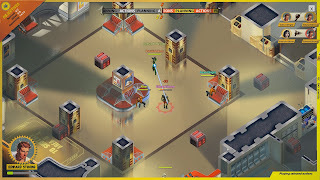 In the normal mode you start with a flat, empty lot, some cash and a small selection of buildings, scenery and dinosaurs available (this mode will be the focus of this article). The custom game let's you set various parameters for your game such as unlimited money, all research unlocked and all dino species available. There is also an alpha random terrain generation (bumpy terrain) option. When you start a normal game you are given the option, by way of a check box, to skip the tutorial. The tutorial still needs some work but does introduce most of the game mechanics and, through exploring the game, those which aren't yet in the tutorial can be figured out. There are a few things which make this stand out in the management sim genre for me, and they make the experience quite unique. Probably the biggest difference to most games like this is the day cycle and how this affects your finances. Rather than running constantly your park closes each night with all guests leaving your park. The end of day is also when your income is calculated. This means that rather than your available cash increasing every time your guest make a purchase you 'cash up' at the end of the day with income from admission, shops and donation boxes calculated against your expenses on food and staffing, although you can see how much is being made during the day as this is displayed in a piggy bank below your available cash. This makes developing your park a bit more strategical as you can't rely on the money constantly increasing. Obviously, creating your enclosures and looking after your dinos is a massive part of the game, and is much more involved than simply drawing a fence. After you have chosen which fence you want, these all have different attributes such as how strong they are or how easy the guests can view the dinos through them, you draw out your enclosure. This is done with a simple click and drag system and if you are near the park boundary you can even use the boundary wall as part of your enclosure to save some cash. But you are not finished there! Each dinosaur species has a specific biome requirement ranging from desert to swamp. To create the perfect biome you need to select the base tile (grass, sand or swamp) and lay this within the enclosure. Now you can morph the biome by editing the terrain to make it more rugged and add water. To help you get it right there is a useful graphic in the exhibit pane to show you the current biome and how ruggedness and wetness will affect it. There are also 'privacy tiles' for each of the base tiles which are essentially long grass which give some shelter when your dinos are overwhelmed. Finally, you need to balance the biodiversity of the exhibit with a mix of trees, bushes and rocks suitable for the chosen biome (again a handy graphic helps you to get it right). Now you're ready to add your dinos. This involves crafting eggs. To do this you need to use the portal room to send scientists back in time to hunt for footprints and skulls. Each species requires a different number of these from their dinosaur family, for example sauropod or theropod, and a gem. These gems can be purchased in town and the items can be combined in the Egg Store. When you return to your park you simply drop the egg into your exhibit and leave it to incubate. Once it is ready a finger icon appears and clicking that will cause it to hatch. During this incubation you can also influence the colour of the dino by slotting different items into the egg. There are currently ove r 20 dinosaur species to place in your park and one of the community members has kindly put together this guide of the dinos in the game. Of course, you have no park without guests and you need to make these happy too. Happy guests will spend longer in the park, spend more at your shops and, crucially, make more donations which is the core income source. You can get an idea of how they are by reading their reviews at the end of the day, or clicking on a guest will bring up the info pane. The thing I found most difficult to get my head round initially was guests saying that the park was boring. This is because the decoration within an enclosure doesn't influence their overall impressions of the park. This means that you need to make sure you don't pack your facilities too close together so that there is enough space for you to place some of the many decor items, many of which require to be unlocked via a research/tech tree. There are two of these in the game, one for park items and one for dino items. The park items are unlocked using research points which are generated by scientists assigned to a research station or a learning point. Dino items are unlocked using hearts which are awarded at the end of each day based on the number and happiness of dinos in your park. As you progress this allows you to unlock the different families of dinosaurs. As you can probably tell the game is a lot deeper than the low poly art style and cute dino accessories (cone of shame for your dinos anyone?) and for being at the very start of the early access cycle the game has a surprising amount of content and polish. I've barely scratched the surface with this post and we will definitely be keeping an eye on this throughout the development. I have no hesitation in recommending the game for purchase, even on day 2 of release. The devs have shown their commitment to the process by already pushing out hot fixes and engaging with the community for feedback. They are in the Discord server daily, have a Trello board and are very open to feedback and suggestions. At the time of writing the game has a 100% positive rating on Steam and as within the top 10 sellers list on Steam for the UK. I have also done something new and have a YouTube video play through of the tutorial and will hopefully find the time to flesh this out into an ongoing let's play series. As always, comments and likes are appreciated and please follow me on Twitter/subscribe on YouTube. If you ever have any games you want to see featured feel free to email me using the button to the right. Parkasaurus is now available in Steam Early Access priced at $19.99, €19.99 and £15.49. 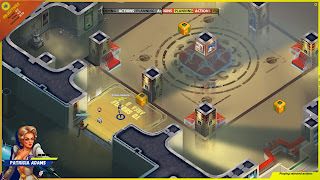 Brought to us by publisher Alawar Premium and developer Cheerdealers, who worked together on Distrust, I'm Not A Monster is a multiplayer, turn-based strategy game, influenced by the popular party games Mafia and Werewolf. 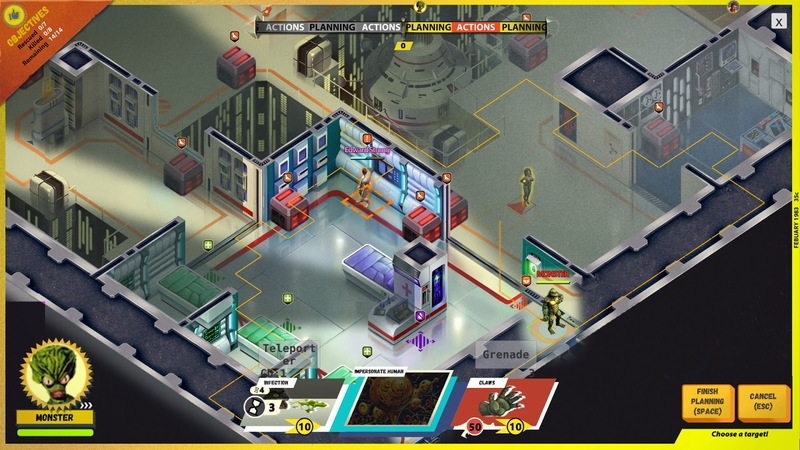 The game has a retro-futuristic feel to it, helped by both the visual and sound design of the game, complementing each other excellently (think 50's B-movie and you are on the right tracks). The back story for the game is that you are on a tourist starship, The Albatross, when disaster strikes and monsters invade, picking off the passengers one-by-one. In the game you are randomly assigned a role at the start of each round, either, that of a hero, or that of a monster. In the version played there is currently only one game mode "Save the Civilians" so we will only discuss that game mode. There is also place holder menu items for "Cleanse the Infected", "Stay Alive", "Battle Royale" and "Evacuate". In the game mode played the concept is very simple. 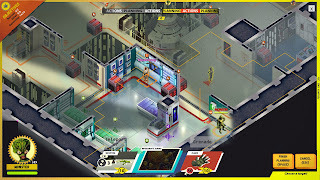 If you are a hero you need to rescue NPC civilians from the monsters, and if a monster, infect civilians and heroes. The game mechanics can be quite overwhelming and confusing at first, for example heroes can have special abilities depending on what weapons and equipment are being carried, and heroes being able to shape-shift to disguise themselves as humans. Thankfully the developers are aware of this and have provided some in-depth tutorials. It took me about 20-30 minutes to play through these and I would highly recommend taking the time to have a look at them, even if just for the accompanying voice over. What makes it interesting is that if playing as a monster you can choose which human character you wish to disguise yourself as. This can be used to your advantage. If someone notices you changing form as you are in their sight, then you can change to imitate a different character to try and disorientate the other player. As a monster you are able to infect both NPC civilians and player heroes. To do this you need to change into your monster form and attack, holding the other character for 2 turns without being attacked, to infect them. If a hero isn't healed within 5 turns, they become a monster and if a NPC is infected a monster who is killed takes over that body. Once 50% of the civilians have been rescued/infected the round ends and you are shown stats for the match. 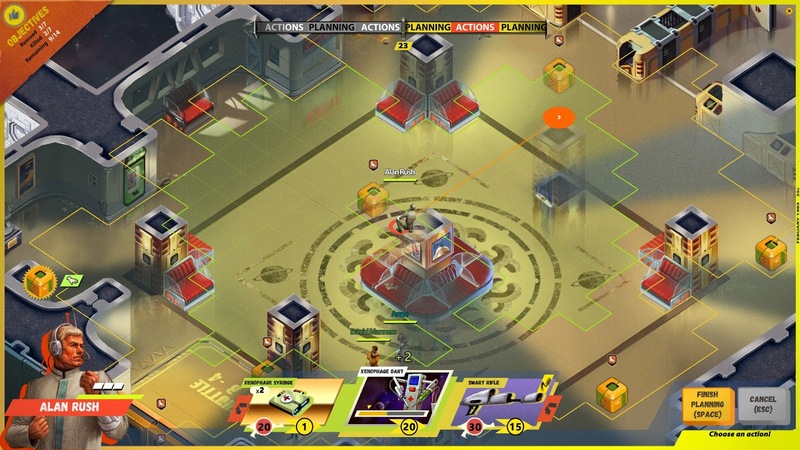 The game is designed as a multiplayer experience for 6 players. The game cannot be played with less than this, but the devs have taken steps to make this as simple as possible for players. The first option is to populate the game with friends from your Steam list. To do this you simply click on one of the boxes with a '+' symbol at the top of the screen, and select them from this list. The other way to find players, or indeed fill the gaps when playing with friends, is through a matchmaking system. This all happens automatically when you start a new game. The software will search for players to fill the gaps in your game. If the system can't find players, it will add AI bots into the empty slots after about 45-60 seconds meaning that you will always be able to play. For being in a beta state the game feels very well polished with no major bugs that I have experienced. There is a lot of information on the HUD which is a bit spread out in places (I often forget to check the status of my character in the character portrait for example) but for me the real attraction is the graphic style. Not only do you have the retro sci-fi art, but as you play you also get the ocaissional blemish on the screen, really adding to that feeling of watching a B-Movie play out. We don't have a release date yet (other than it is expected later this year) but this is certainly a game that I will be keeping my eye on. The developers have also been fairly active on Steam with regular news articles, responding to players on the Steam Discussions and also pushing updated versions of the demo with bug fixes fairly regularly over the past few weeks. As an added incentive for players to join in this phase the developers are offering a prize draw for all users who participate in the open beta and complete a short survey from within the main menu for Steam keys of the game when it releases. The demo/open beta of I'm Not A Monster is available now for free on Steam. 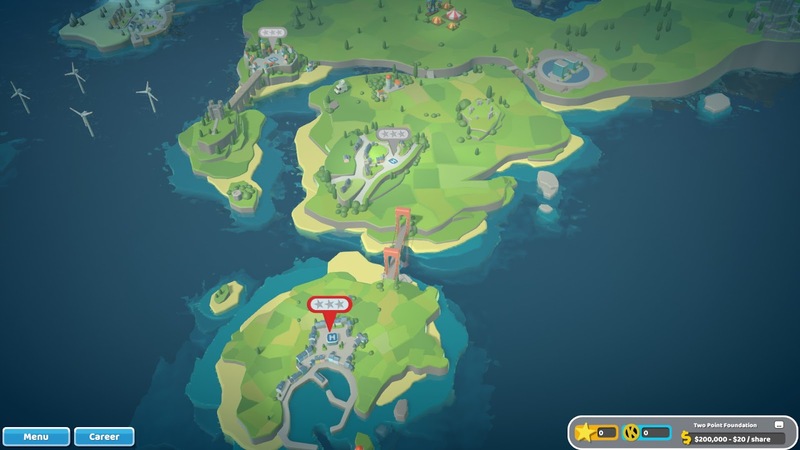 Two Point Hospital is the first game to be made by developer Two Point Studios, formed in 2016, and published by SEGA. Don't be fooled with the studio being young however. Two of the founding staff (Mark Webley and Gary Carr) have been working together making games since 1989 when both worked at Bullfrog Productions, now part of EA UK. Games that the pair worked on previously include Theme Park and Theme Hospital whilst at Bullfrog, and The Movies whilst at Lionhead, so they certainly aren't newcomers to this style of game. Due to this history of the dev team, some people have called this game the spiritual successor to Theme Hospital and the devs have stated that this will be the first of a series of management games to be set in Two Point County. 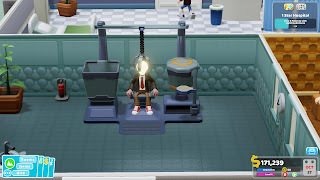 I will probably be drawing A LOT of comparisons with Theme Hospital throughout this post, and it's something very hard not to do. As soon as you load your first hospital the similarities are fairly obvious. The art style retains the fun cartoon look of its predecessor and is complemented by a fun soundtrack, which is very reminiscent of The Movies as it is in the style of a radio station with humorous presenter interludes, and comedy illnesses, such as Light Headedness and Jest Infection. 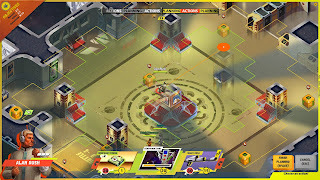 Each level has a series of objectives, such as cure a certain umber of patients or earn a certain amount of cash, and a chance to get a 1, 2 or 3 star rating. These are not a measure of your success over a set period, but are more like the apprentice, entrepreneur and tycoon objectives in RCT3, where completing a set of objectives unlocks the objectives for the next star rating. After completing the first star you can choose to continue with the same hospital, or progress to the next one. If you choose to progress, you can return to the previous hospitals later, with the advantage of any unlocked items and tech you gain in other hospitals being available, which makes the higher stars easier to attain. The early hospitals act as a tutorial of sorts, with each introducing different game mechanics, for example Mitton University only allows you to hire junior doctors and introduces research and focusses on staff training. 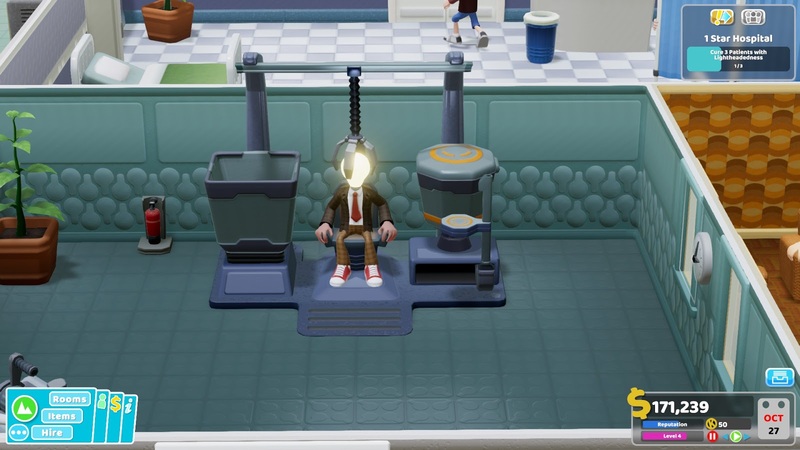 These will break new players in gently, but will also help to familiarise seasoned management sim players to the specifics of Two Point Hospital. Whilst the basic game play is similar to Theme Hospital, there have been a number of changes making the game look fresh. The most obvious of these is, of course, the look. Whilst retaining the fun and quirky style of Theme Hospital, the graphics have been brought up to date. This makes the game at first glance look simply like an HD remake but it is soon evident there are new things to see. The character models and items all look a lot cleaner and more detailed and, with the free cam perspective, they need to be, as objects can now be viewed from any angle. This leads on to one of my favourite things. We have more free placement of objects rather than items being tied to one of 2 orientations. This is going to lead to the opportunity to be even more creative when designing your hospital, with many items not being locked to specific rooms as they were in Theme Hospital. As this is primarily a management game, the simulation is as important as the aesthetics. 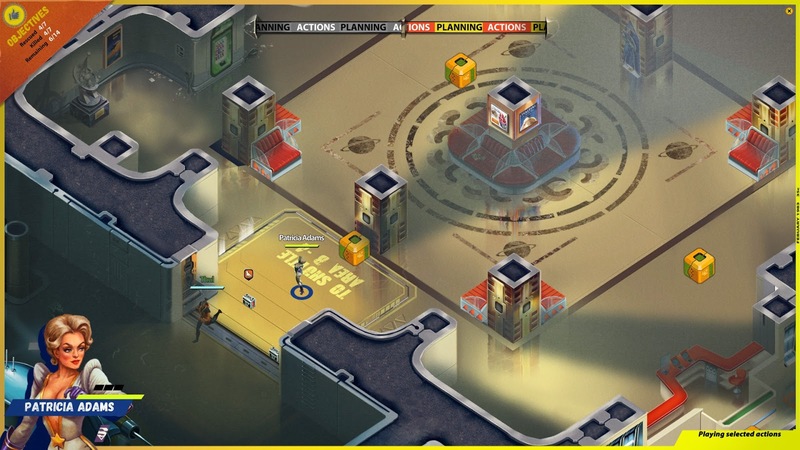 This has also been taken up a level compared to Theme Hospital with a wider range of challenges and options. Are patients too hot or cold? Provide them with aircon or radiators. Patients getting bored whilst waiting? Offer them a leaflet stand or magazine rack to give them something to read. There are all the management things you would expect from this type of game such as planning and designing rooms, managing needs of staff and patients, research of technologies and training of staff, but there are also some other nice touches. For example, when building bathrooms, you can now assign these to be male, female or staff only or when designing your reception area, rather than plopping down a single desk, you can now create a reception 'island' (once you have unlocked it) with workstations for multiple staff and all the associated items from a reception area, including filing cabinets, various plants and even a donation tin to sit on the desk. 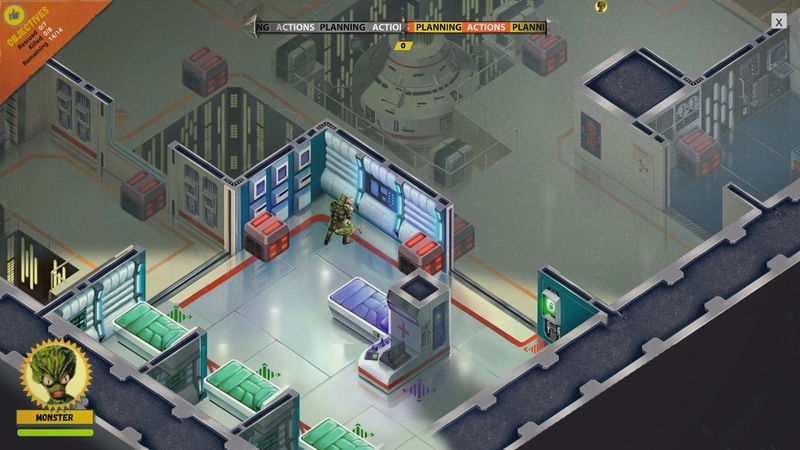 In summary the game looks great and will be enjoyed by both Theme Hospital veterans and newcomers alike. 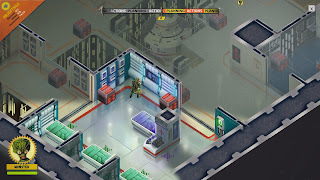 This takes the solid base created by the developers when they made Theme Hospital and really builds on it with new and reworked mechanics and a simulation much deeper than the graphics would have you think. There is also a completely new list of maladies and associated treatments and clinics and new options for diagnosis and customising your hospital. It has to be said though that the game is very much a new Theme Hospital, which has resulted in some mixed reviews with people saying it is too similar to its predecessor. 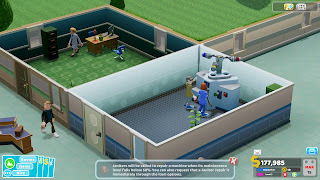 If you are looking to relive the experience of Theme Hospital the game is definitely worth it, if you want something new in a hospital management game check out Project Hospital which comes out next month.